It turns out CD Projekt RED designed two games during the development of The Witcher 3. Gwent is a county in South-East Wales. It’s also now a card game for two players, commonly played in the pubs dotted around Wild Hunt’s game world. It’s not unheard of for open-world games, and RPGs in particular, to indulge in a simple parlour game to distract players when they wander from the main path. But CD Projekt reckon Gwent’s initial simplicity conceals “ultimate depth”. Invented by dwarves and perfected over centuries of long afternoons at the pub, it’s a “fast-paced” one-on-one card game about the clash of two armies. The players are leaders, and the cards their soldiers. Or, you might say, minions. 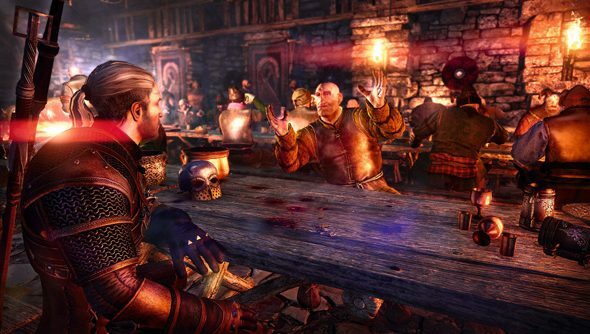 “[Gwent is] something beloved by both road-weary travelers during long nights around the campfire and elegant nobles looking to liven up dragging dinner parties,” write CD Projekt. There are four different factions in Gwent, and a spell system that has players controlling the weather to affect units on the field. Or, er, table. Like they said: depth. Microsoft have paid for a physical version of the card game to be produced alongside The Witcher 3’s Xbox One special edition, made up of over 150 cards. There’s currently no other way to buy it. Anybody else have fond memories of KOTOR’s likably simple card game, pazaak?